But in most cases Peter managed to stop – in spite of it all – usually a mile or so further down the Hwy. Then I would grab a plastic bag and get out and track back along the shoulder of the roadway towards my often distant target. I usually had seen it only for a fraction of a second in the corner of my visual field, but I KNEW, what it was and that I had to “go get it”. 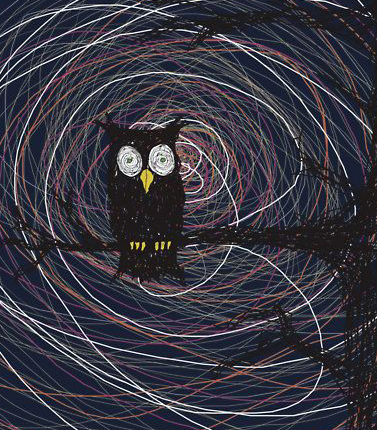 This is me, you are reading about, so this most likely has to do something with Owls, right? 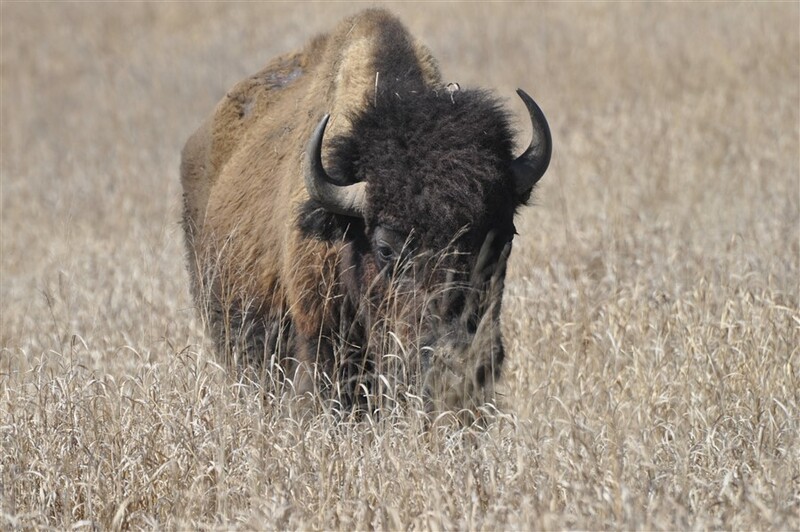 While I stumbled along the road shoulder I most often passed other unlucky road victims: Deer, sometimes more than one, Coyotes, that had come to feed and became victims too, Badgers, Foxes, Vultures, Dogs, anything…..
By the time I reached , what I had seen, I usually was in tears. But these Owls I could not just leave here, they had to be carefully taken up and a more dignified last Resting place had to be found. A song, a chant, for these Owls, their mates and for all the others, that I had to pass and had to leave there…..
Oftentimes there was a suitable place nearby in a field, under a Tree, facing East, out of wind and sun. 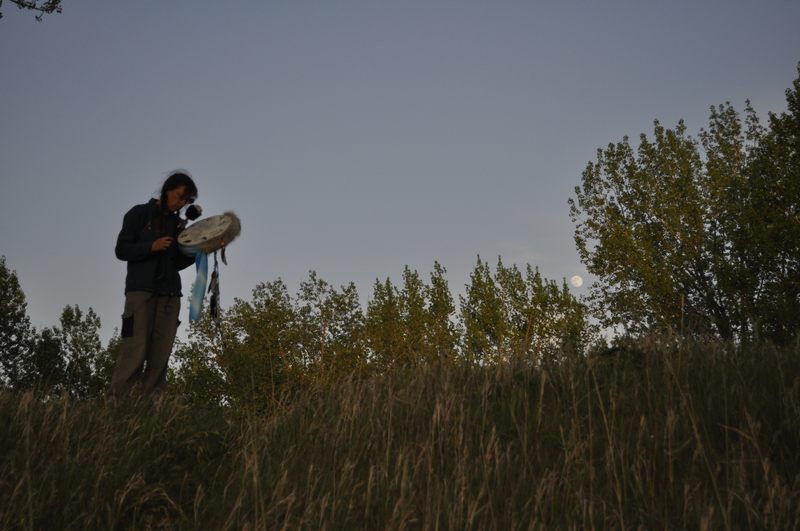 Often there was not and I trudged back to the “Turtle” carrying my sad burden along a trail of death and sadness. We then had to get off the hwy – fast- before …. 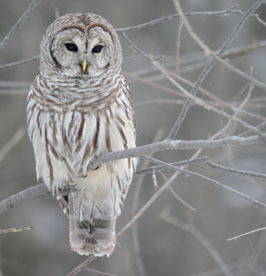 the smell, you know…..
Find that little clearing with some Trees or Mesquit brush…..
On time, I “found” a Long Eared Owl just at the turnoff to a busy rest area and proceeded to carry him into the nearby woods, under the highest Tree. When I put him there, I discovered Owl Pellets. This was HIS Tree! Where he had roosted during the day and dropped his pellets. 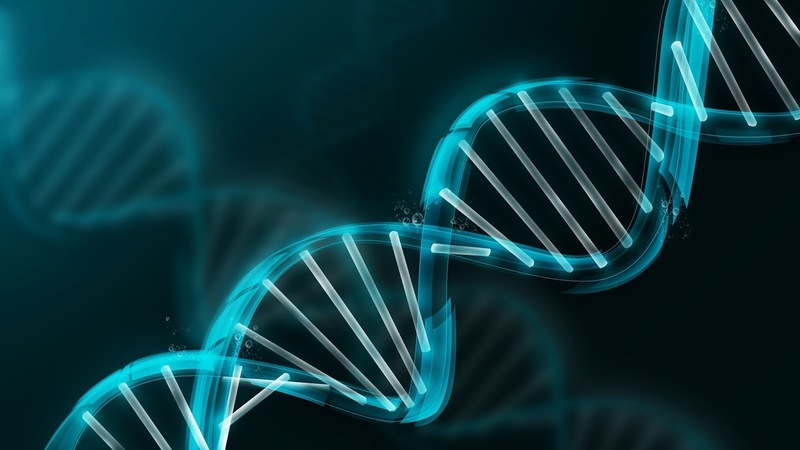 I was indescribably unravelled, emotionally, and cried for the better part of an hour……. 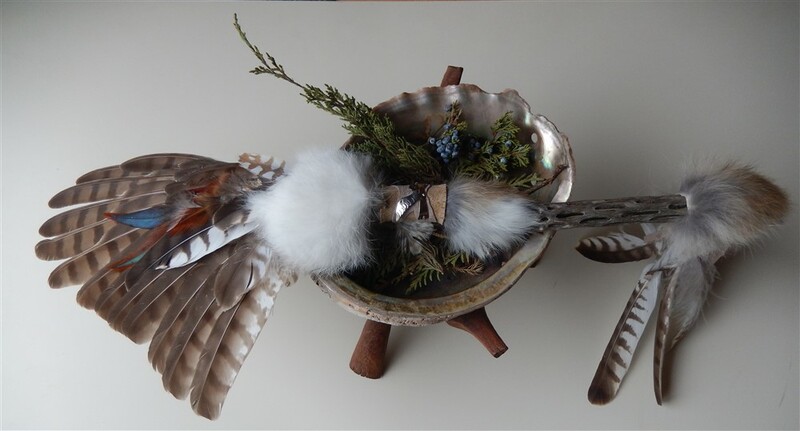 Yes, I also took some feathers, promising to create something beautiful and lasting in honour of all these Creature – and all that lived and died along with them. But, having wild Bird feathers is prohibited in the US. In instances like this, I HAVE to go with Spirit. It is the VOICE OF THE SPIRIT, that showed me where that Owl was to be found, and to take a few feathers……..
On my sad walks to and from “my Owls” I also passed by Raptors. Red Tailed Hawks, Swainson’s Hawks, Kestrels,….. The large Raptors most often had the tail and large wing feathers missing. – So someone was here. 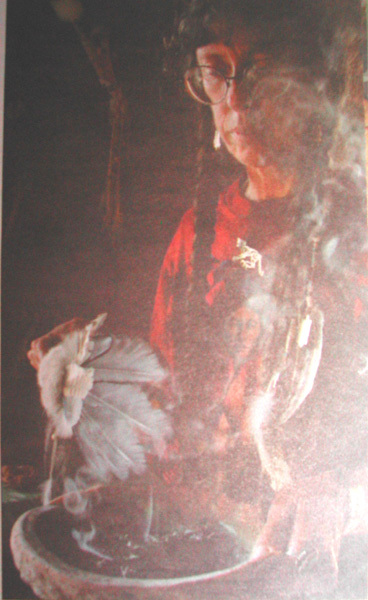 Native Americans most likely, because sometimes there was a fistful of crumbled up cigarets beside or underneath the Bird. A gift in reciprocity for the feathers taken. Often all I had to give in exchange was a chant and a more dignified resting place, sometimes a few Cedar twigs, collected for this purpose. 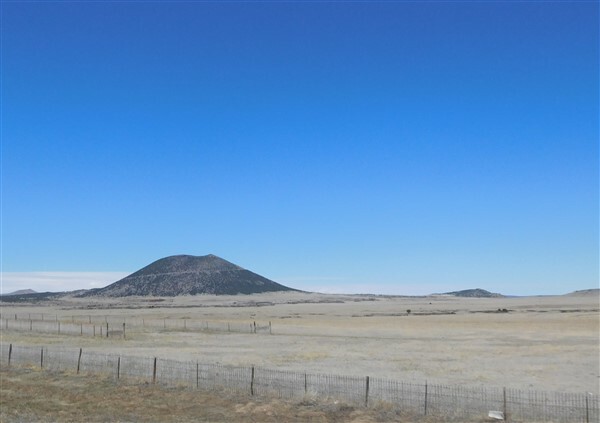 Another time, during a lonely drive on Hwy 87 from Clayton to Des Moines in New Mexico, Peter struggggeling to hold on, to force the motorhome forward against a blasting 40 miles/ hour West wind, white knuckled hands clamped around the steering wheel, the Turtle shaking like a bucking bronco, when I SAW HER! Wrapped around a road sign post. He did and I ran back. Large, well preened beautiful feather dress, silky soft. I cradled her in my arms like a baby, my tears dropping onto her perfect feathers. When I laid her out on the floor of the Turtle, Peter cried too. Gently straightening out her broken neck and singing it back together, singing her back to LIFE. But it is not. Death is our last friend, for all of us. Death is her friend too. Better like this, than slowly starving in the ditch with a broken wing. We agonized over her for the better part of the afternoon. We could not bring her to some taxidermist to treat her and send her to Ontario. We could not, in this climate take her perfect wings and claws and do the work ourselves. We could only take a few feathers and then try and find a bush to put her under or into, away from the sand-blasting winds. It took 30 miles, to find such a place at the foot of Carpulin Volcano. A Cedar bush, away from the murderous road and the murderous winds. Through my tears I sang for her. After this gut wrenching encounter, the Spirits must have thought, that “I had enough”. Enought tears shed and definitely enough feathers – in fact, waaay more, than I could handle, and so for the next month or so the “sightings” and the “Stop screams” ceased. But, there were other “second sight” , that were happening. I will be back to bring these to (virtual ) paper. 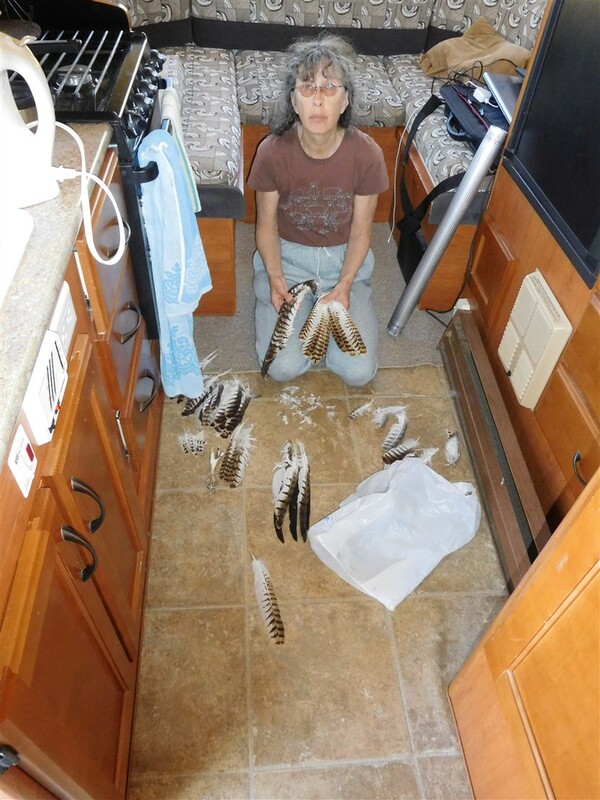 What did I do with my feather treasures? I have a few trusted students living in the US, that got strange parcels with mummified Hawk claws, Fox Skulls and of course Owl feathers. 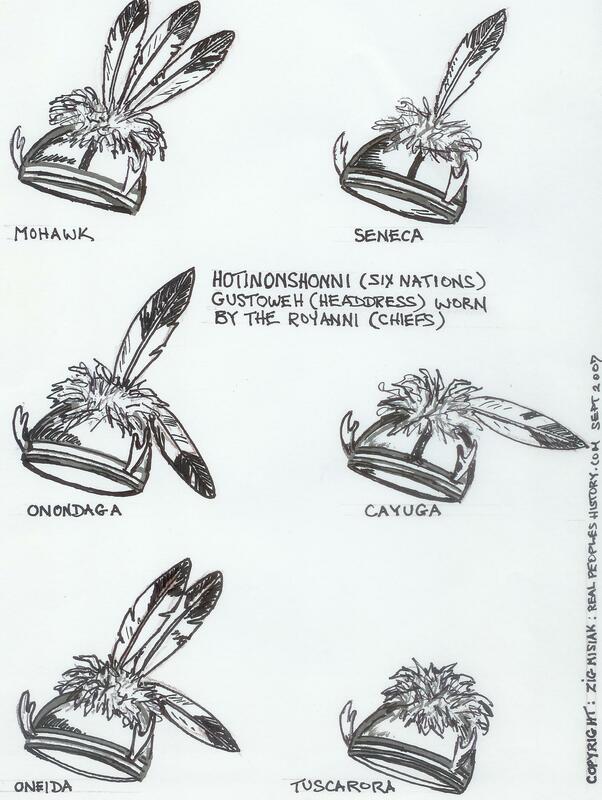 I also know quite a few First Nations leaders, that live and work in large cities and appreciate Hawk feathers for sprucing up their Gustowes and for the Feather Dance for the kids they teach. A few treasured Owl feathers I send home. They now eagerly await me working on/ with them. Ultimately they wait for YOU, to own and treasure them as I do. One thing about travelling is, that your daily spiritual practice has to go travel with you, to provide continuity. Some personal rituals may have to be adapted to fit seamlessly into the ever changing days of a traveller. Peter and me on the road in the “Turtle” quickly fell back into an old routine, established loooong ago, when we travelled the continent first in our old VW bus and later in the larger “Bumblebee, our Mercedes motorhome, that was roughly the same size, but had none of the comfort that a small modern motorhome has. Back room and space was at an absolute premium, especially because we had a full jewellery making workshop on board, but today there is no need for that and so there is space in the many cupboards for among other things a box containing my smudging shell, some herbs, a small Rattle and a small Medicine Pouch, things that will make up a portable Altar. In another cabinet there is my bag with my travelling Drum. This is the one I first created for the trip to Nepal and that has since then always been tossed into the back of one of our cars, when we were away for a few days – be it to an out of town craft show or a week’s vacation in Algonquin park. Here at home in Canada I can take along pretty much any “Medicine item” I want, but on this trip we were going across the border into the USA. That means we can not have any feathers or other “Animal products” on board and we and our vehicle have to weather hours of searches and interrogation before being allowed to pass. NO FEATHERS!?? How am I ever going to do that?? Rip off all the feathers and fur off my drum?? NO WAY! 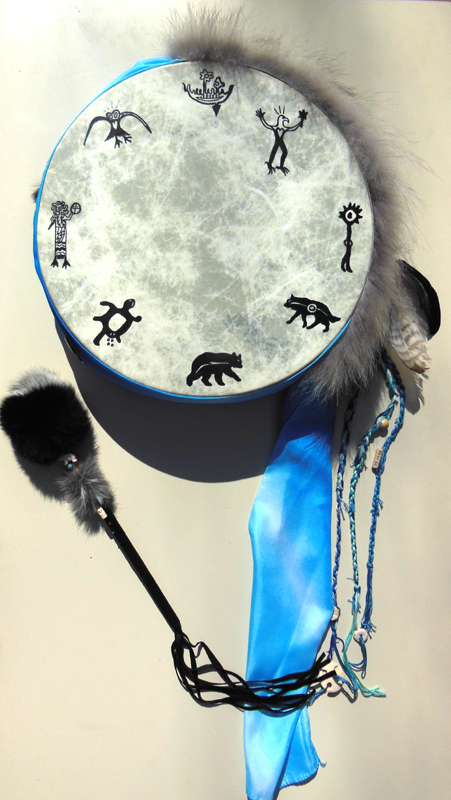 I decided to just risk it and leave the drum as is and ifffff custom rips the feathers off I would replace them with whatever I found on the road. My beautiful Rattle however had to stay home….. 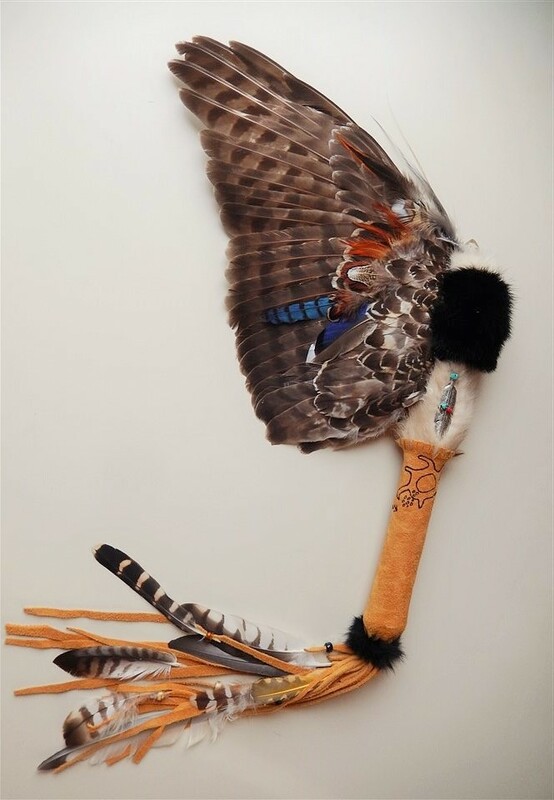 But for my Night Prayers, for my nightly “giving Thanks to my Miahanits and Ancestors” and my prayers for my clients and charges I realllly wanted to have at least 1 Owl feather – to focus my thoughts. So I hid one large Great Horned Owl feather among our travel brochures. At the US border we ended up being rudely questioned as to our motives for travelling, finances, jobs, family situations, affiliation to bomb makers and terrorists for 5 1/2 hours. The Turtle was searched through – top to bottom twice. They did not confiscate my 2 onions and 1/2 cucumber, or our yogurt and 2 pieces of bread from the fridge, they did not care about that feathered noisemaker in a bag, they did not take away our 3 pieces of firewood from home…… They were just loooooking for guns and bombs. We have none of those. Finally we got our visa stamped and were on our way. What a degrading experience that was! 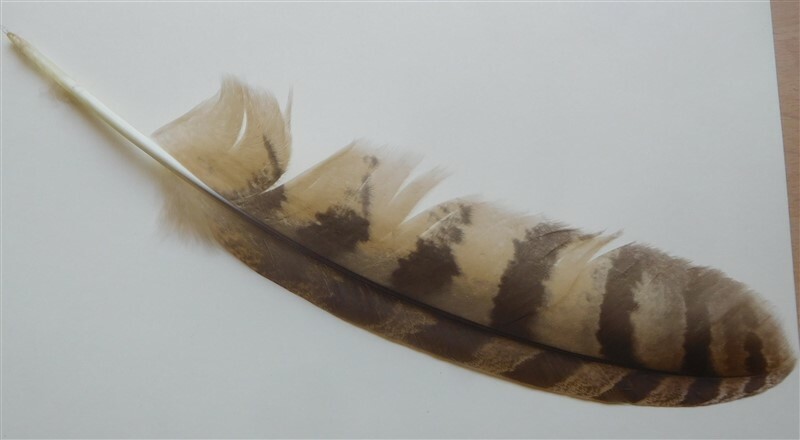 But that rainy evening, on a loud rest area South of Duluth I dug out my Owl feather and said Night Prayers for us and a safe journey, for everyone, that has to endure these kinds of indignities and for all the people that are being kept out of the ”Land of Plenty” bu bureaucracy and fear. We were away from home and to a certain extend also from the internet. A little well deserved break. 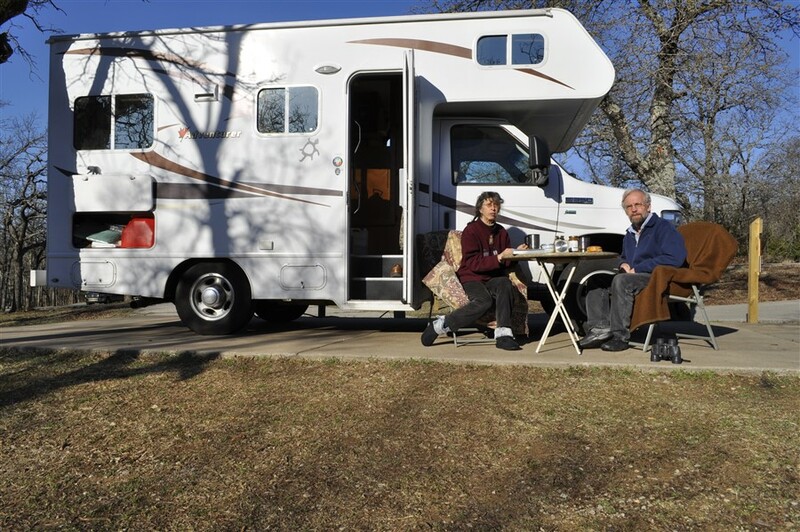 We took our mini motorhome, called “the Turtle” on the road for 2 1/2 months travelling down to Oklahoma, New Mexico, Arizona and then up to South Dakota and sloooowly back home to Ontario. Many of you guys know, that we used to travel like this – first in our oooold beat up VW Bus, then in our little bigger but just as beat up Mercedes cargo van. From 1981 to 1989 we crisscrossed the country, spending summers in Alaska or the Yukon, in the fall went down to Mexico to create a whole bunch of beautiful jewellery and then sell it first in Florida between February and April and then on markets all across the US and Canada. THAT really was the birth of Bearpaw Jewellery. 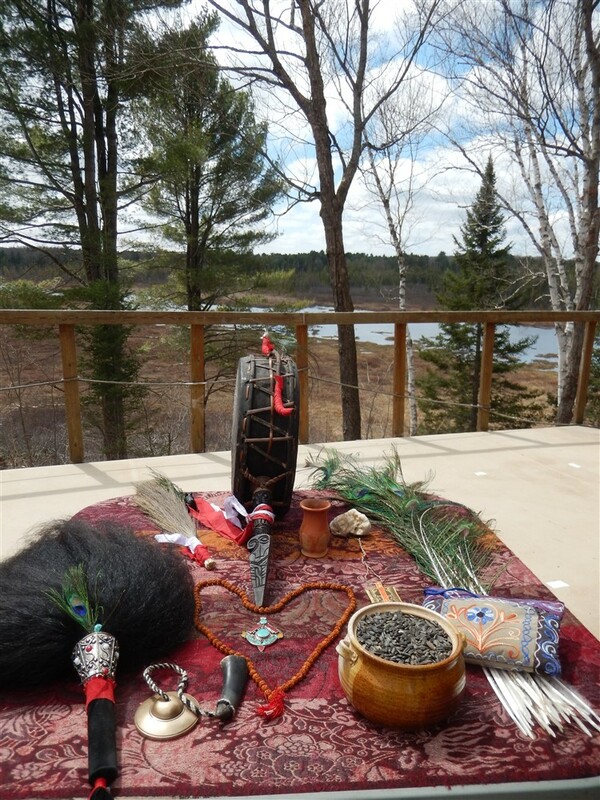 But as you remember, that, when we settled in Ontario very soon Bearpaw Jewellery and our creations took over our life and I had to struggle fitting my shamanic clients and patients as well as teaching engagements, students and lots more in and between craft shows and art exhibitions……. Well, now Peter is 63 and I will be 61 soon, so we decided, to “switch gears” again , demote the almighty Bearpaw to hobby status, quit a whole bunch of shows and galleries and do a few more things we reallllly love doing, like travelling. I will not be home year round and available at all hours of day and night. But on the other hand, I can stay in touch with my clients via internet, I can skype with them and some of them I also can stop by and visit. Spirits of course travel VERY WELL! Mine also like it, when I am on the road. But I can find secluded places in Nature to do that. ….. first have to catch up with all the stuffff that piled up, while we were away….. 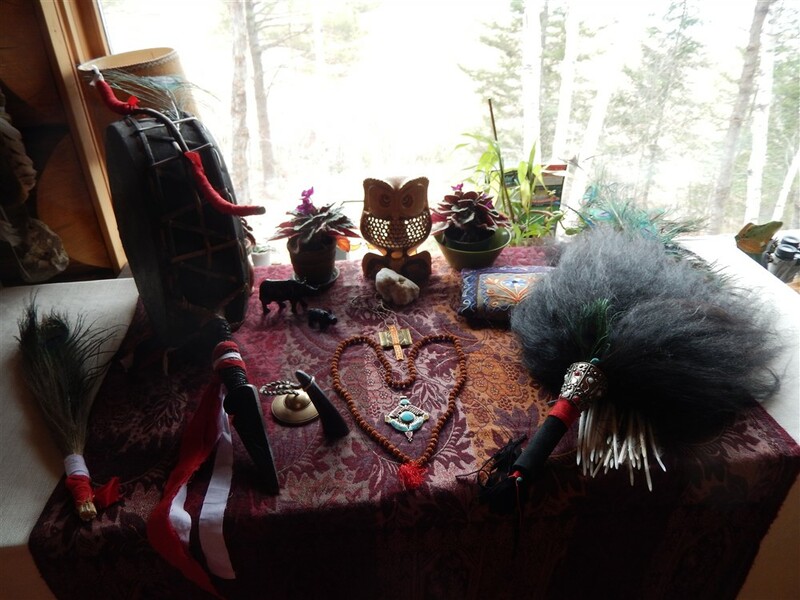 I felt compelled to set up a little memorial Altar for all the People of Nepal. I feel involved, because we have been there. In this beautiful country with sooo many of its gentle people living in the simplest conditions – some in what WE call poverty. Then I took my drum- urgently, because the trance was coming on fast. A few beats and I was THERE! Scenes drifted by with me as an observer……. People in the streets – surprisingly mostly men – Where are the women? Where are the children? Many men were holding cell phones – others were engaged in helping, digging away rubble – brick by brick…. Then a HUUUUUGE semi-transparent Snow Leopard – a Spirit Being jumping onto a huge pile of concrete and re-bar – a collapsed structure. Hissing and scratching with his see-through paws, then jumping of to grab a large brown mongrel dog with a black tipped tail and dragging it up onto the pile of debris – making it scratch – and bark – and so alerting the ever present men., who soon began clearing away smaller pieces of rubble – then trying to hand down a plastic water bottle – to no avail- the person below has his hands trapped ( and crushing injuries to his pelvis and abdomen) Not good for survival even if he makes it to one of the overcrowded hospitals. Someone opened the bottle and poured the continence over the man’s head and into his open mouth……. Grey Spirit Beings, transparent, like the Snow leopard, walking away, up in the sky above…. Souls on their way towards re-incarnation. I am looking through the window of my Mt. 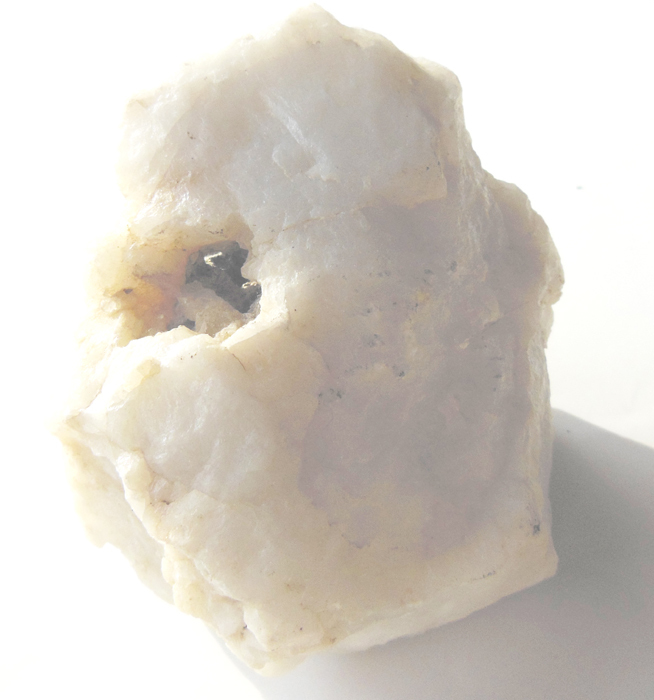 Kailash rock crystal. From the fist size stone on my makeshift altar it has changed into a HUUUUGE mountain of ice, snow and clear crystal. Ah, I ge it, he is “over there! 🙂 I then see him, somewhere, in the city centre, in amongst some green plants, white shirt – maybe his shaman outfit – with some smudges of fresh blood on his chest, where his heart is – his heat is bleeding for all his people….he seems exhausted, but OK.
Then I am in ? …. Bhaktapur -? The city centre is in ruin! Soo sad! The shop, just off Druban square, where I bought my nice Owl…. 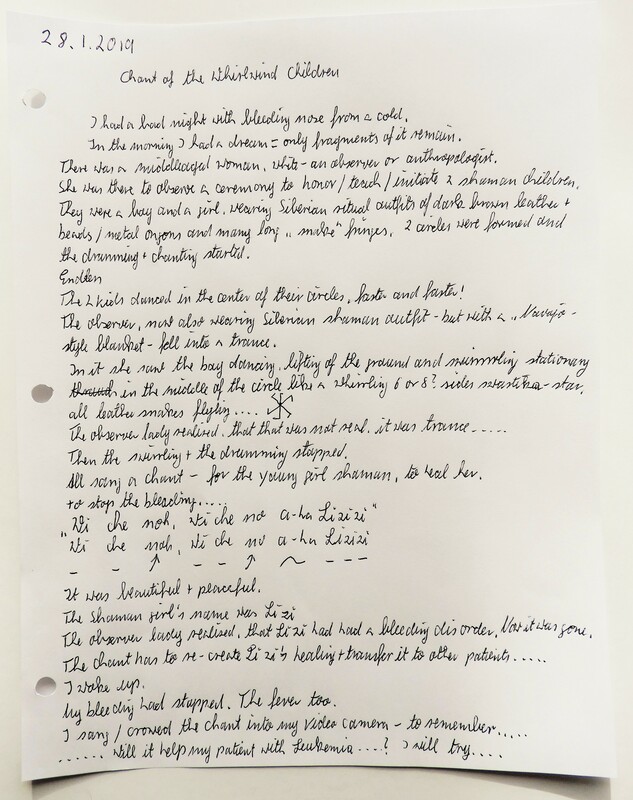 in ruin and rubble…. but no lives lost, just dust, bricks, wooden planks and broken carvings, large and small. People sifting through it, saving what they can…..
A few streets on the “drum shop” …. Bricks and wood and the ever present tangle of electricity lines – dust and debris, but the shop still stands, with part of the upper story of the house having come down… Here too people clearing the narrow lane way, saving what they can and not knowing, where to put stuff they recovered. ….. The Pottery market – where my Rhino is from – all just rubble, all just pottery shards…. The cobble stone plaza right before me starts to buckle and heave and out of the cobblestones a life sized Rhino emerges, shakes itself, looks at me: “It has always been like this – only “THIS” was not always here!” The primordial Beast shakes it’s head and moves off, down the street….. He has done that for ages of eternity. But sometimes, on rhythmic occasions (having to do with 80 sun cycles ) the monster moves. Sometimes Shiva just looses a step or so, regains his balance and dances on. No big deal. 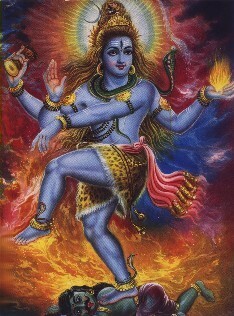 Sometimes Shiva stumbles- steps off the monster, with 1 foot….. and then steps back on, in his dance. Sometimes he loses his step, because the monster rears up quite a bit and both feet come off, then Chungmolungma grows and his backbone becomes higher – and yes, She also shakes off some of the snow, and it comes crashing down. It was always like this! Shiva is blue = for truth! Usually the Animal Beings sense, where Shiva’s feet are, and when the Earth woman moves- and they get out of the way – fast….. Most make it – others become food for the survivors and then become part of the Earth Woman – until she sweats them out and up to live between Shiva’s feet again…..
Now maaany of the Earth Beings have started to erect dwellings out of stone and wood upon the Earth Woman – right between Shiva’s feet. Sometimes he stubs his toes on them, when they get toooo high! But now, when the Earth Woman moves, these dwellings topple over, killing them = returning them to her womb. It happened before – it will happen again…… it is always a tragedy, when it happens. But Shiva dances on, regardless. I see a giant Turtle, swimming in??? The sky!?? – no, in the water, carrying the world, as in Native American world view. She too is very much alive, of course! She moves, her back shakes, then, she lowers her head and dives beneath the waters, while a HUUUUUGE wave washes over her back, drenching all that live there, washing some of them off into the sea. The Turtle re-emerges and swims on…. Somewhere I realize, the tone of the drum changed! I too got drenched, when she moved?? The beautiful sun in which I started drumming had turned into yet another icy April shower and I better get “with it” and get inside, save all my things, dry them out and put dry cloth on! I re-erect the little Altar in the living room, adding my hand carved Owl from that shop in Bhaktapur. Then I go outside and distribute the Gift for the Spirits of the Land – this land, where I live and The Land, we all inhabit. A Sunflower Seed for everyone who died. Please Shiva, dance gently on Earth Woman! That bluish blob does not belong.